ABOUT: The Administrative Codes and Registers Section will hold an on-line meeting in February instead of traveling to Washington, D.C. for the 2011 Winter Meeting. 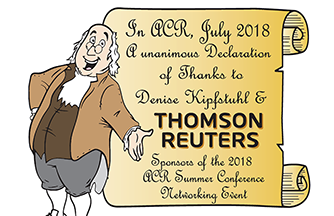 Because of the extreme economic circumstances facing most of the states, only a small number of ACR members could attend the planned face-to-face meeting. To remedy the small attendance numbers, ACR has arranged to use a “virtual classroom” for the on-line meeting, which will be held on February 10 and 11, 2011. To register for the on-line meeting, please download the registration form (pdf) found on this web page and fill it out electronically. CONFERENCE FEE: Please note that there will be no charge to attend the on-line meeting. Colorado ~ Code online version as official in law – See Colorado APA. Idaho ~ Code online version as official in law – See Idaho 67-5204. Publication of administrative code. Kentucky ~ Proposed legislation changes to APA – More Here. SharePoint (Microsoft) in the future? Learn more about SharePoint here. New Mexico ~ To publish or not to publish? Supreme Court Decision and 32 rules based on Executive Order 2011-001. New York ~ Weekly e-mail notification of availability of on-line Register. E-certifications accepted in the fall of 2010. Oregon ~ On-line Notice Filing System to be able to add attachments and longer summaries. Texas ~ Word docs filed. No more SGML with XML tags. Dan talked about the term “cloud.” Cloud computing systems provide computation, software, and data access services without requiring end-user knowledge of or dependence on the system’s physical location and configuration. Utah ~ E-Rules 2 – Live July 2009, User Manual for E-Rules using DocBook markup. Division of Administrative Rules partnered with Division of State Libraries to create a catalog materials incorporated by reference. Review of all regulations. Governor initiated, read the Blog page of the list Web site for more information. Not done by Executive Order. Virginia ~ Amendments to APA 2011. Washington ~ Governor EO 906 Rulemaking Moratorium; 2006 Electronic Filings began via e-mail; 2007 Official Version on-line of Register; Code on CD once a year. Incorporated by Reference Material – States that allow it, who does it for future use? The Utah Division of Administrative Rules has generated an MD5 hash for the PDF files (files saved with an “.PDF” extension) and the compressed WordPerfect files (1996 and 1997 only; files saved with a “.zip” extension) that can be downloaded from this web page. An MD5 hash is, in essence, a signature for a file. You can confirm the integrity of the files you download by comparing the MD5 hash the Division has posted with one that you generate. Various software packages are available that permit you to generate an MD5 hash such as MD5Summer (graphical user interface), winMD5Sum (graphical user interface), MD5SUMS (no graphical user interface), or File Checksum Integrity Verifier (no graphical user interface). If the hashes do not match exactly, then the integrity of the file is in question. Please contact the Division of Administrative Rules immediately if the hash numbers do not match.